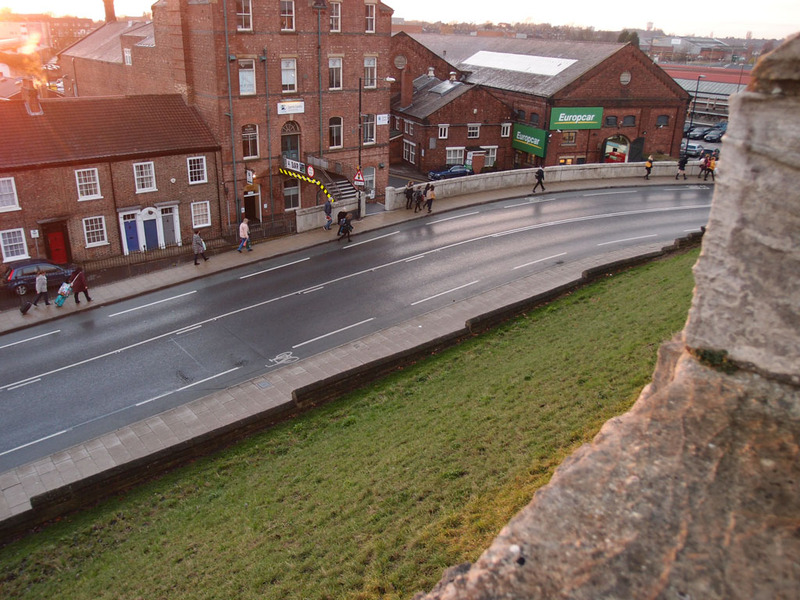 From Hudson House, built on part of the old railway station site, just inside the city walls, to Queen Street bridge, close to the current railway station, just outside the city walls. Hudson House has been demolished, and it looks likely that Queen Street bridge will also be demolished, as part of the plans for the station front and the area around it. This was on the agenda at the recent council executive meeting on 29 November. The report prepared for it (PDF on this link) ‘sets out progress to date on the above scheme and seeks approval to submit a planning application and proceed to work with partners on the detailed scheme in the Spring’. As approval was granted, a planning application for changes in this area will follow in due course. There are many aspects to the proposals. A consultation over the summer provided information on the various aspects of the redesign, which looks interesting and has been generally welcomed (though there are some specific concerns, raised at the meeting this week, more on that later perhaps). Here on York Stories I’ve often liked to focus on lesser-known aspects of the local environment, and Queen Street bridge probably comes in to that category. 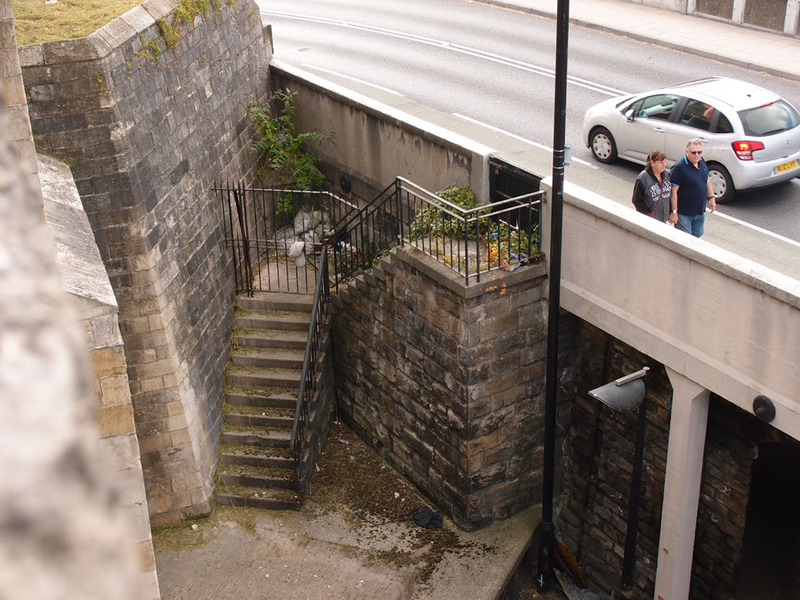 The bridge on Queen Street was built to cross the railway lines that once went through the city walls to the old station (see the previous page). The site of the old station has changed a lot over the years, and no longer has railway lines. Queen Street Bridge has therefore been redundant as a bridge for many decades. 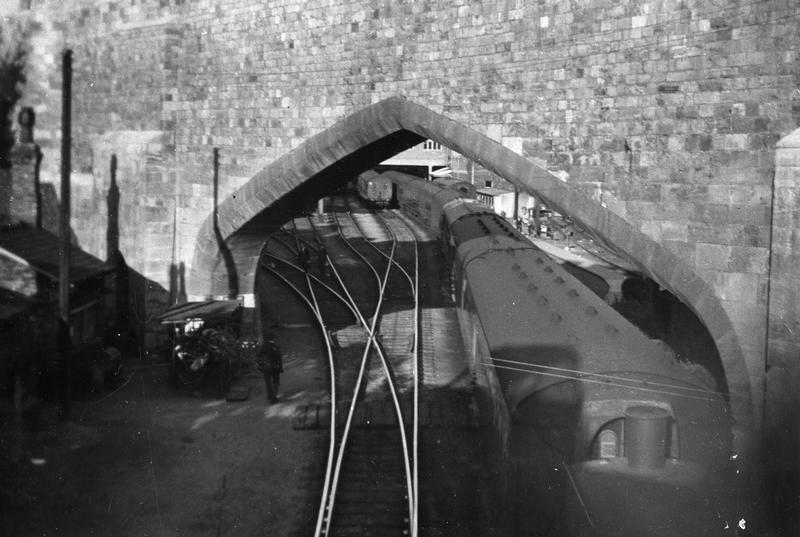 Here’s a photo from the archives taken from Queen Street bridge, showing the railway lines going under it and through the city walls. The Hudson House site is visible through the archway, and in the background so is the end of West Offices. Queen Street bridge isn’t generally recognised as a bridge, these days, and that’s not surprising, as many of us will have never seen anything travelling underneath it. 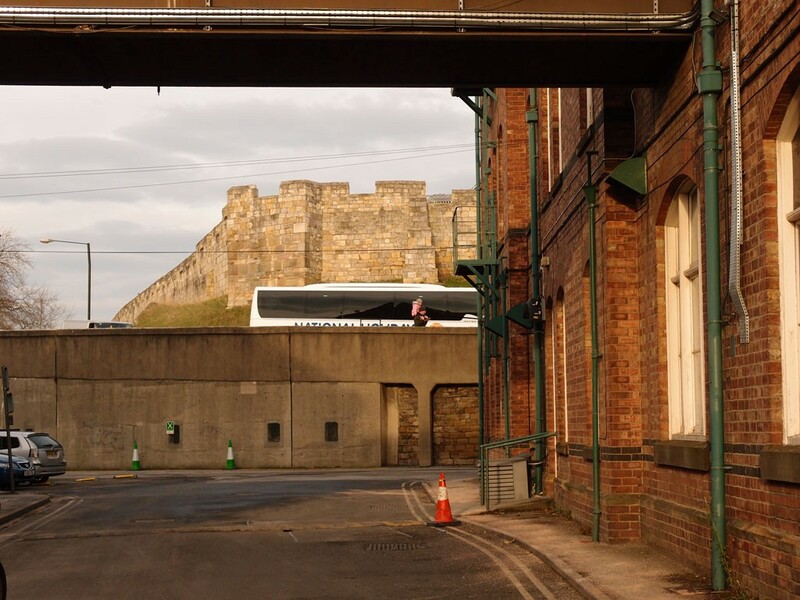 I remember as a teenager catching buses from Acomb into town, and how the buses would follow this bit of road close to the city walls, rounding the corner here, with the station building mainly below, and I never gave it a thought. It was just a bit of road. An elevated bit of road. It takes a while to fully appreciate the histories/levels/layers of a place. 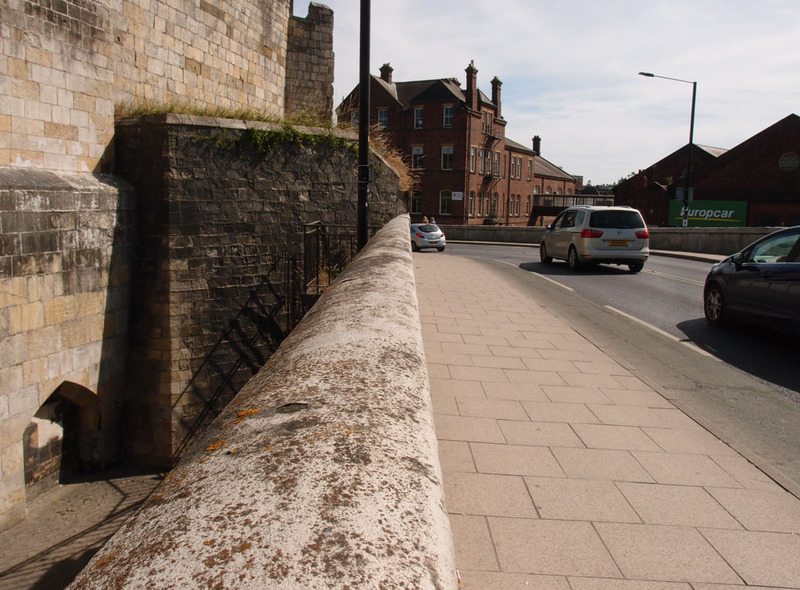 The bridge was built in 1877-8, close to the corner of the city walls, surprisingly close. Anyone looking down on the bridge from the city walls might notice that between the old stone of the walls and the rather more recent bridge are these steps, at one time accessed from a gate on the bridge. Another apparently more recent gate has also been added at the top of the steps. I wonder how long it is since anyone went up or down these steps. This stepped area appears to be serving no purpose apart from being an informal litter bin, a dead debris-collecting space. 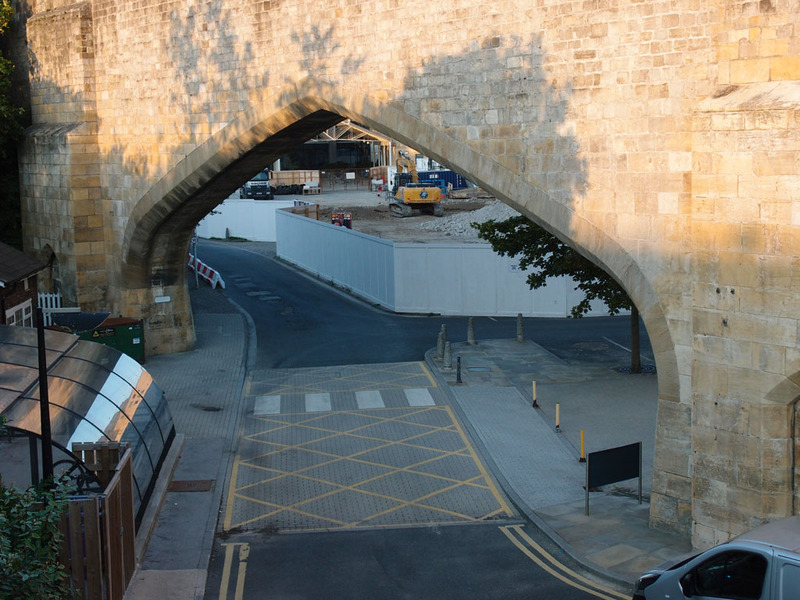 The demolition of the bridge would open up views of this part of the city walls, the arches here, where the trains used to come in. The bridge has clearly changed a bit since it was built, and from above just looks quite modern and concretey. 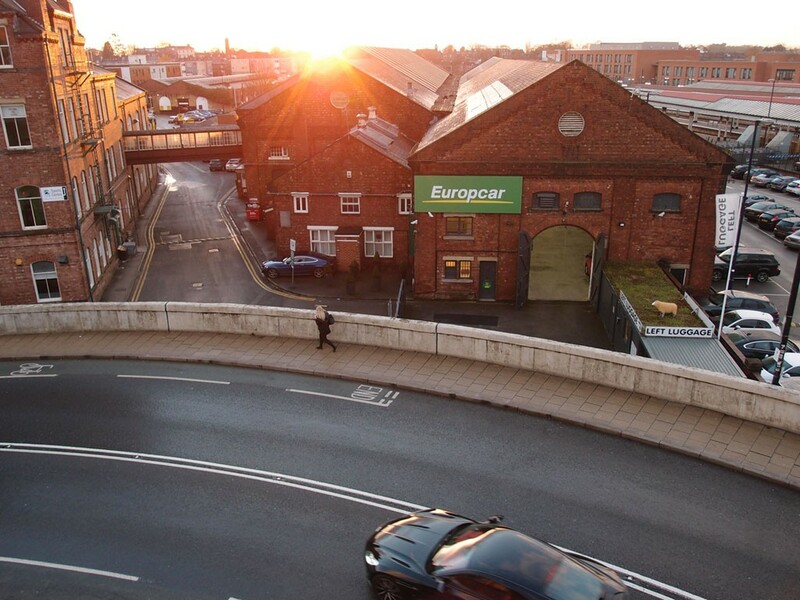 The bridge, built in 1877-8 to replace a level crossing which had existed since 1839, served to admit railway tracks across this street into a railway terminal depot within the city wall. Although new station facilities were provided outwith the City Walls with the opening of the current station in 1877, the North Eastern Railway (NER) wished to retain railway access across Queen Street, although their use of the tracks would be considerably reduced. Railway use of the level crossing fell considerably with the opening of the 1877 station, road use however rose greatly, so the bridge was built at the behest of York Corporation during 1877-8. The Bridge was modified in 1909, with the two northernmost arches being replaced by a single steel-girder span. In conjunction with the corporation having acquired horse-drawn street tramways, and a move to electrify them, the bridge was widened by moving the pedestrian footways out onto extensions flanking either side of the bridge. These were constructed at the city’s expense using reinforced-concrete stanchions; a good relation had existed for some years between the NER and the ‘Hennebique ferro-concrete’ consultant L.G. Mouchel. The bridge ceased to span railway tracks in the mid-1960s with the building of Hudson House. 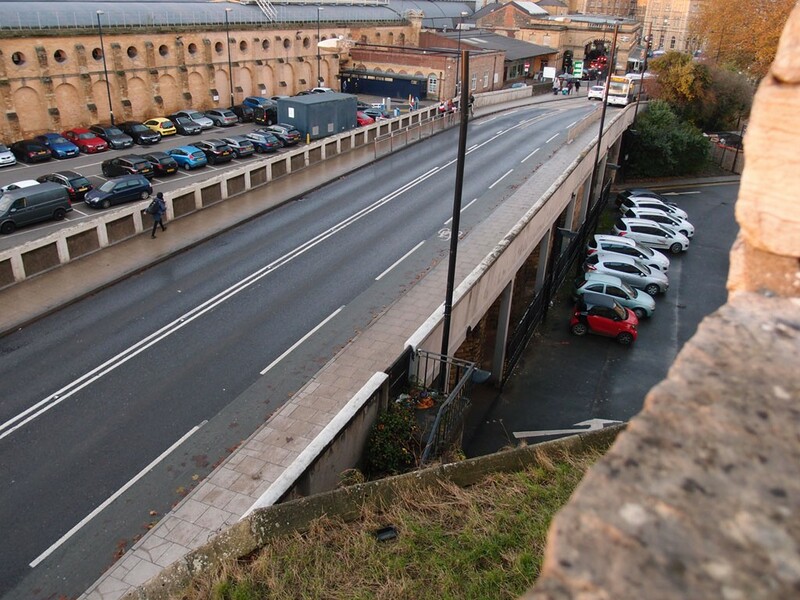 By the 1970s, the concrete structure was beginning to pull away from the original bridge, possibly as a result of vehicles mounting the pavement, so work was carried out to bond these back in and address damage to the bridge parapets. There is impressive 19th century brickwork underneath it, in parts of the tunnels visible from the level of the station car park alongside. But from all other angles it looks rather awkward now, a concretey thing rising up out of car park and blocked off with steel fencing. All it does is to restrict all the traffic here to using it, while there’s a lot of land just below it and around it that could be remodelled to fit better with the needs of the 21st century city. Then we approach the corner, with the Railway Institute buildings (several, of various dates) in their proud position, close to the ‘new’ (current) railway station. 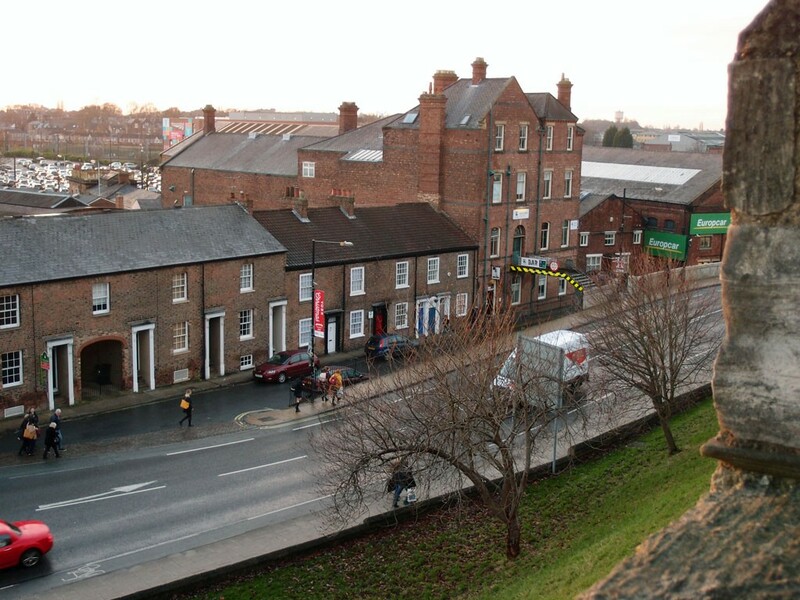 Then we’re at the corner of the city’s historic walls, with the end of the railway station platforms on the right, and the Railway Institute buildings straight ahead. 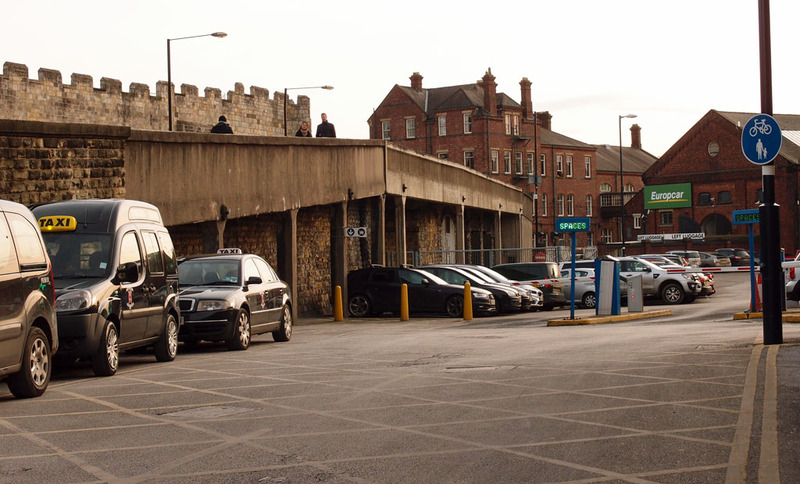 Back in early 2016, when a public consultation on plans for the whole York Central/station area asked for our views, there were concerns about the future of the Railway Institute buildings. 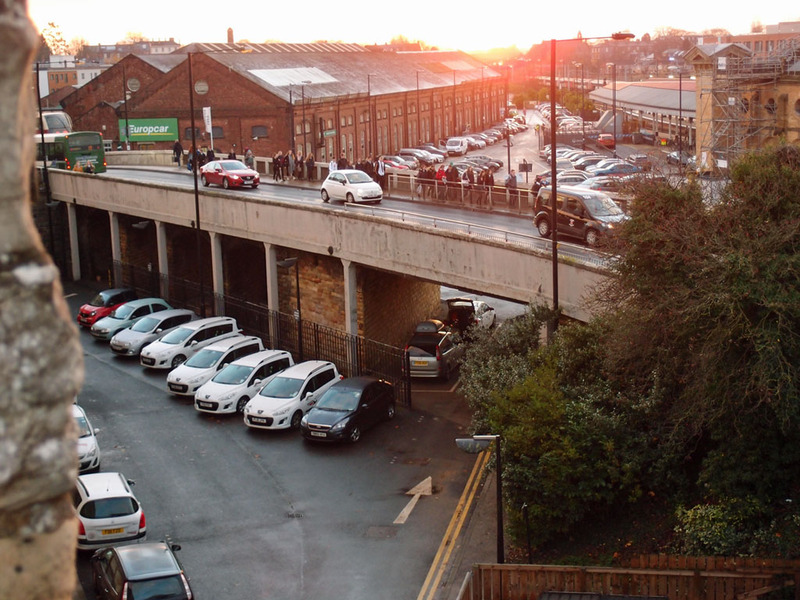 Back then I wrote about those buildings and Queen Street bridge, and felt quite strongly that none of these structures should be demolished, as they’re so important in illustrating the railway heritage here, and the line of the old lines in to the old station. But since then, as we have had more detailed plans of how changes here might make better use of the space, and benefit everyone who uses the current station, and travels to it and past it (whether in vehicles, on foot, or by bike), I can see that the demolition of Queen Street’s bridge does make sense. More importantly, in the wider plans, the Railway Institute buildings are to stay in place, though one small building, the band room, looks likely to be demolished, as a planned road won’t fit round it. Much more could be said about the wider plans for the area, and many interesting comments were raised in the discussion at the executive meeting this week. More later perhaps on other aspects. 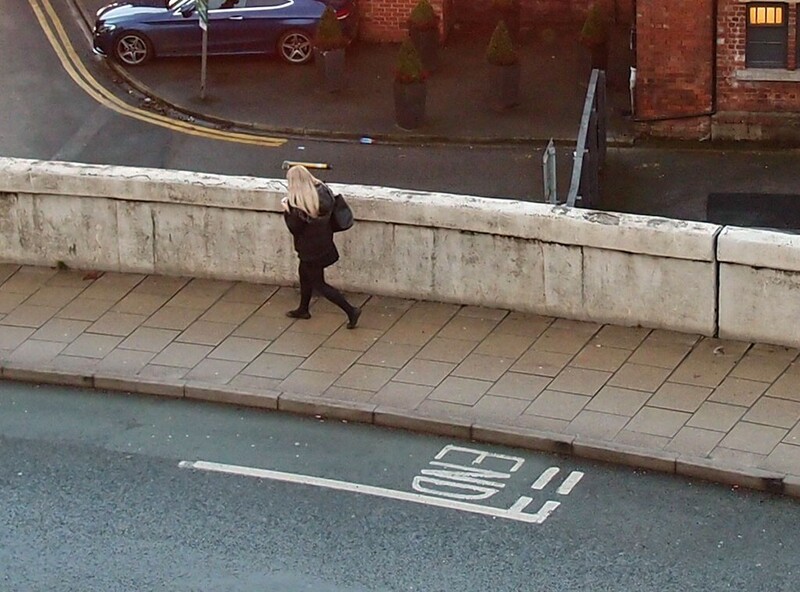 In the middle of Queen Street’s bridge, somewhat randomly, a marked cycle lane on the road reaches its ‘END’. If the bridge is demolished then it makes more space for everyone. This space should I hope work better for all road users, and pedestrians. On the 2016 page focused on this area I wanted to see the bridge kept because its arches underneath seemed like they’d provide a good traffic-free route for cyclists, if opened up rather than fenced off and blocked. 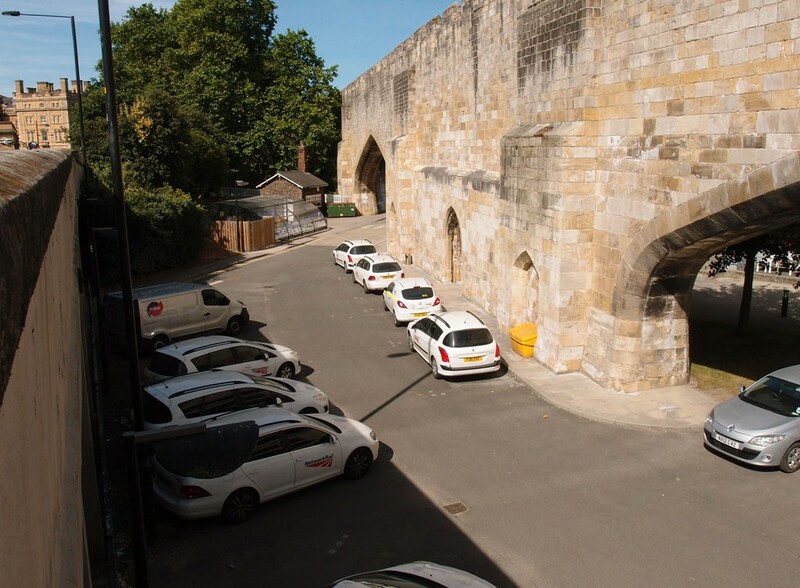 I imagined us being able to cycle through them and the arches in the city walls here, along the remaining access road to the side of the Hudson House site, to the NER war memorial and West Offices. Some of the information provided in the consultation this summer included a diagram suggesting this link past Hudson House might be part of the redesign of the wider area. Other plans didn’t include this link. So I’m not sure whether it’s part of the plans or not. The planning application documents I’ve since looked at relating to the Hudson House development indicate that the site, as bought by Palace Capital, includes the part of the access road alongside it. In other words, as I understand it, it’s private land. 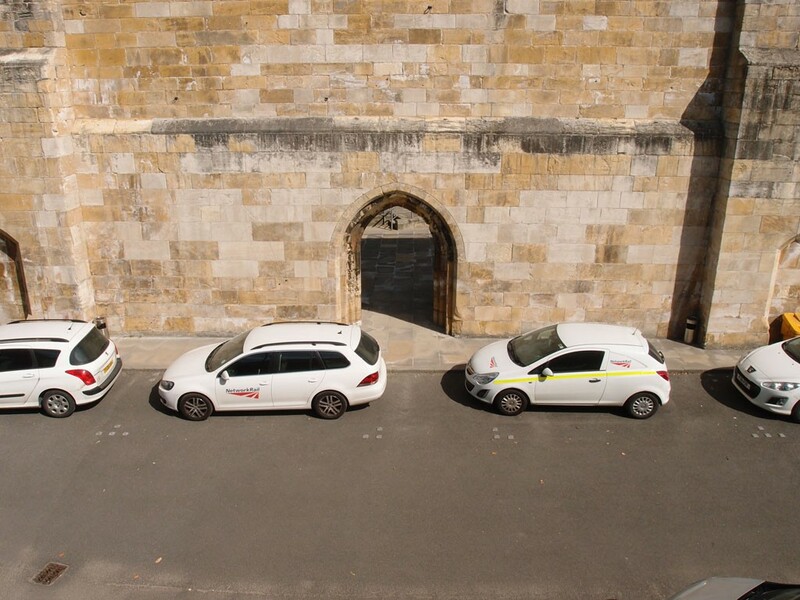 For the sake of the city’s heritage, and our understanding of it, I hope that this line of travel will be part of the wider scheme. If the removal of Queen Street bridge is supposed to help us better appreciate the heritage/cultural value of those 19th century arches cut through the walls — which is one of the reasons given for the bridge’s demolition — then cycle/pedestrian lines of travel through them, and to the old station they served, are a crucial part of it. We can look at them already, from the bridge, as I’ve pictured above. Travelling through them, like the trains used to, that’s the bit I’m interested in. York Stories is a resident’s record of York and its changes. I write about what I know, and raise questions about what I don’t know. I recognise, as many people do, the value of local knowledge, and do my best here to share the perspectives and thoughts of this particular resident, born in the city in the late 1960s, observing the changes. I’ve always aimed to represent things as clearly as possible to as wide a readership as possible, as accurately as possible. It takes a while to do that, and to reach the standard I always aim for. If you’ve found it of value then virtual coffees are always appreciated. Thanks to everyone who supports these York Stories in this way.